congrats. well done. this was my favourite! Ursula, I love this photo! I only wish the flare behind the flower on the left wasn't there, otherwise it's perfect. I didn't vote in this challenge but I'm so glad the voters voted you so highly. Ya got nice bokeh there, baby! Bet ya show that to all the guys on the first photo outing, don't ya? Excellent example of delicate. I think the delicate was captured by your skills, moreso than the flower itself. Congrats on the top 10, I still think this should of ribboned. Message edited by author 2005-11-02 18:05:06. I could have sworn I commented on this during the challenge! I just love this on many levels. The circular movement of the blurred background in combination with the yummy shade of blue; the golden flower - placed in a great spot to showcase the DOF. You go girl!!! congrats on your top 10 finish with this outstanding shot. well done!!! This is absolutely, insanely beautiful. This is magnificent work. Kudos for the creativity and originality. Wonderful shades of blue Like the very lightly blurred edges on stems and the circles add a nicu unexpected extra touch. Deducted 1 point due to the circles near bottom that are a harsh white. they distract from your main theme. Otherwise a superb entry "9"
Very delicate, I love the white orbs, feels like a day dream. 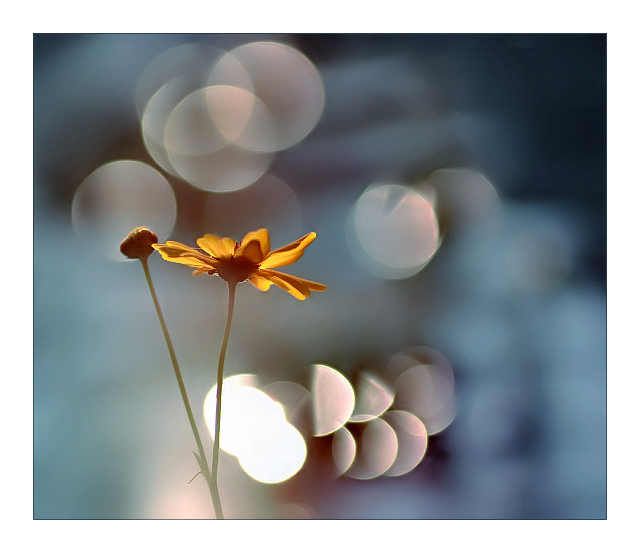 very nice shot with beatiful bokeh! well done! Light and ethereal looking. Like the shimmery, blurred effect. LIght on the flower is good. Nice job. I like this photo especially how the petals appear almost glowing. Very nicely done. Good luck. very nice! i really like this. nice placement of the flower within the frame. great colors and full of interest. thanks for showing me a picture of a flower that is more than just a picture of a flower. the border works very well also. good job. you win first place from me...10. Great depth of field and color. The fact that the background is so out of focous really makes the shot. Absolutely stunning! I do wish the white highlights at the bottom weren't there. Great Job! Beautiful shot. I like that it's different than most of the typical flower shots. I really like what you have done with the lighting. Some may find it distracting but I find it very artistic. Absolutely superb photo, I love it. How on earth did you do it? 9. Proudly hosted by Sargasso Networks. Current Server Time: 04/19/2019 10:18:08 PM EDT.